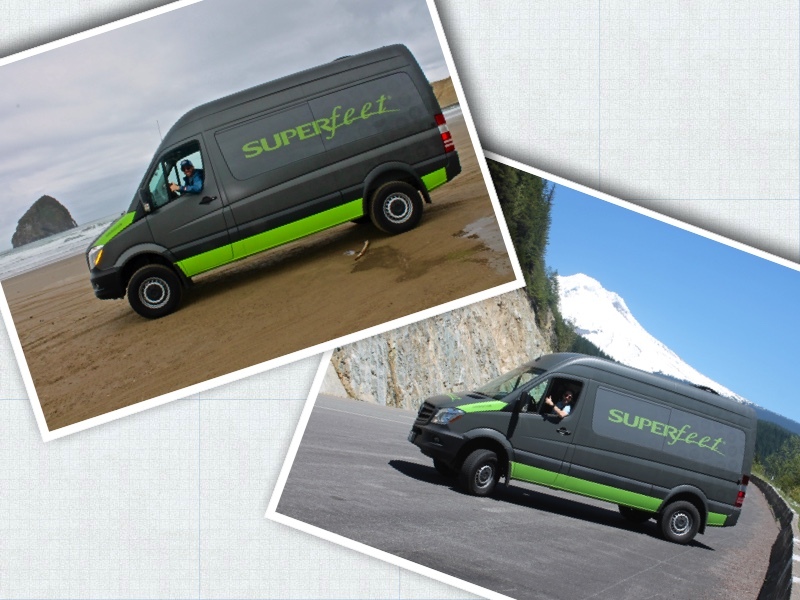 Life Less Ordinary: Meet the SuperVan!! 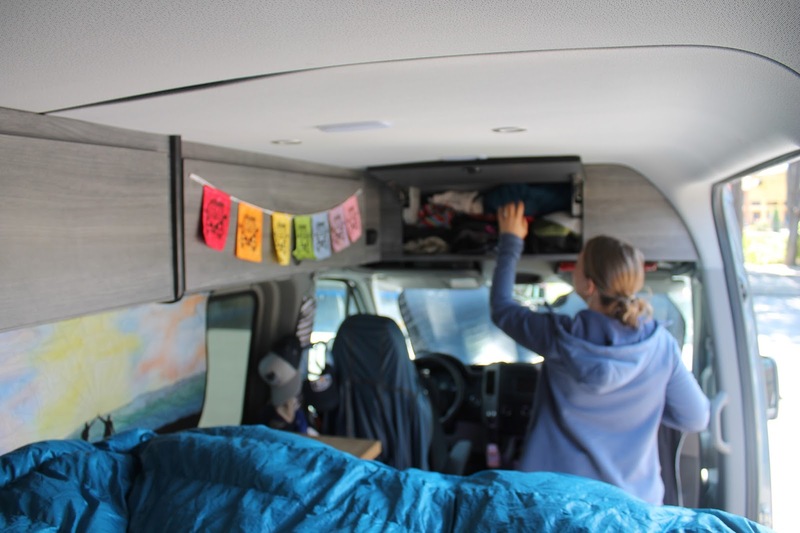 It is time to unveil the innards of our summer home on wheels. Reminder: this van is BORROWED and we have to return it to Superfeet in late July after our NZ speaking tour (sniff sniff). But I digress. 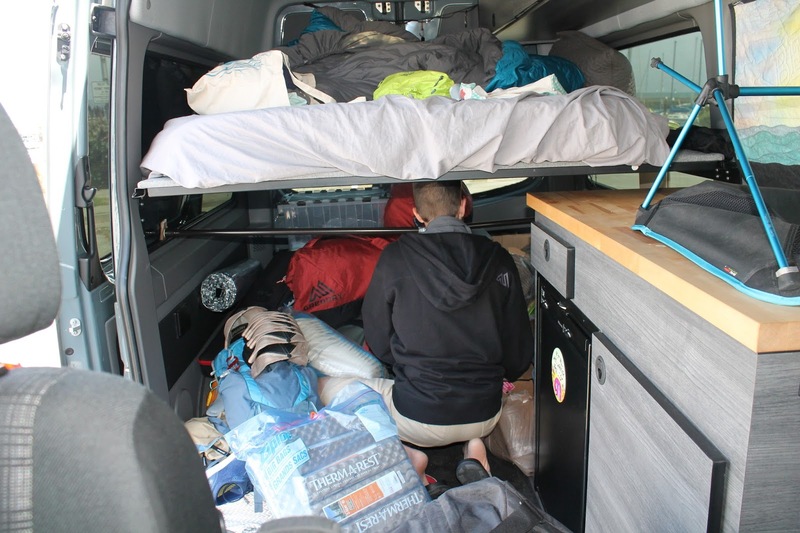 We have traveled more than 2,000 miles in Superfeet's converted Sprinter van for since picking it up in Bellingham, Washington on May 12th. We covered lots of miles through 3 states, going from the mountains to the sea! Still more miles and states to come!! 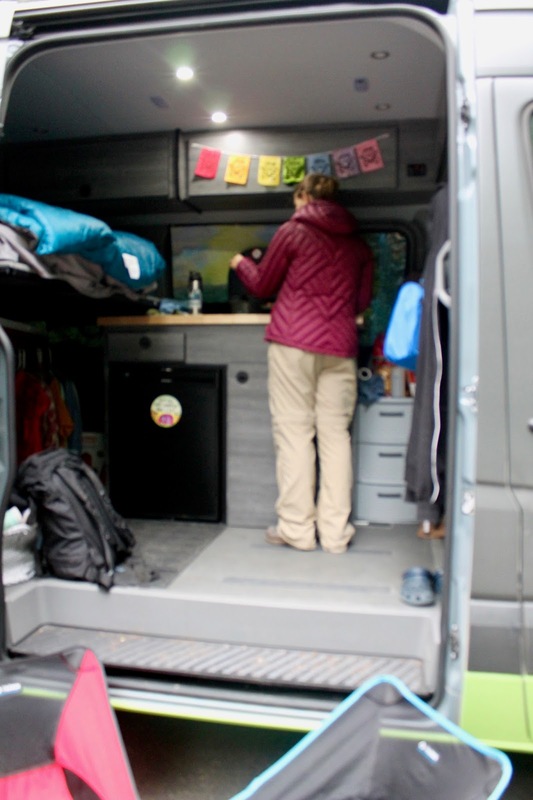 This is the smallest camper we've lived in, as it is only about 18 feet long. 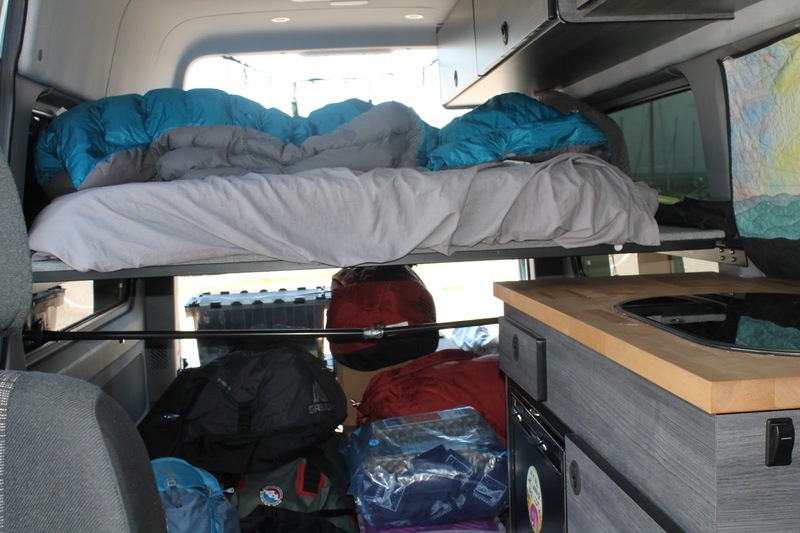 The "living space" (kitchen, bed, storage) is about 50 square feet. Yes, that is right. 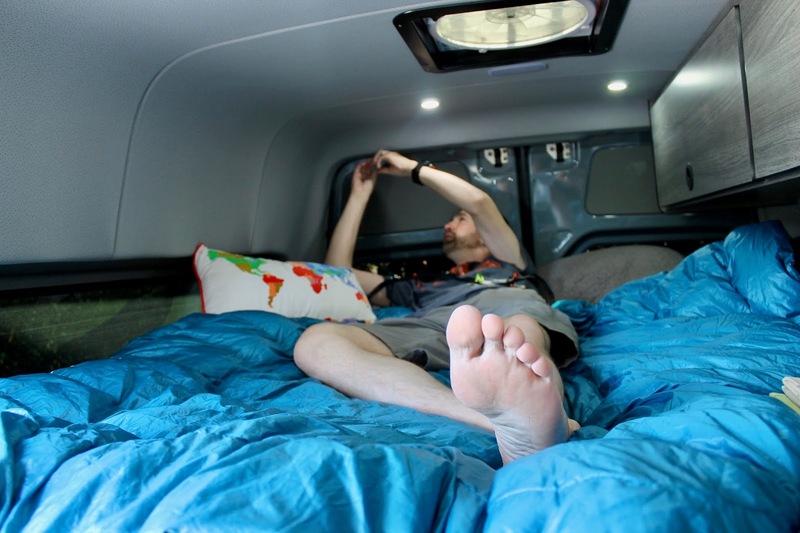 FIFTY square feet. Most people can't fathom living in such a tiny home, but honestly, we dig it. 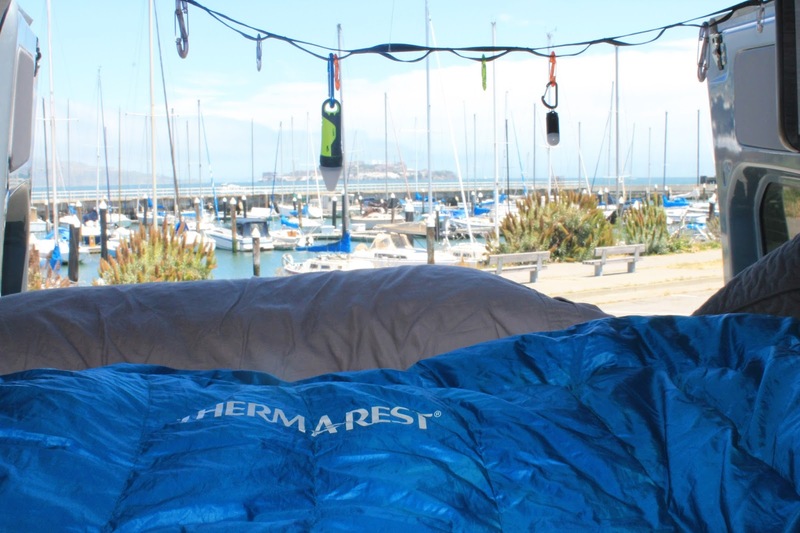 Think of it this way, it is double the size of our tent square footage! 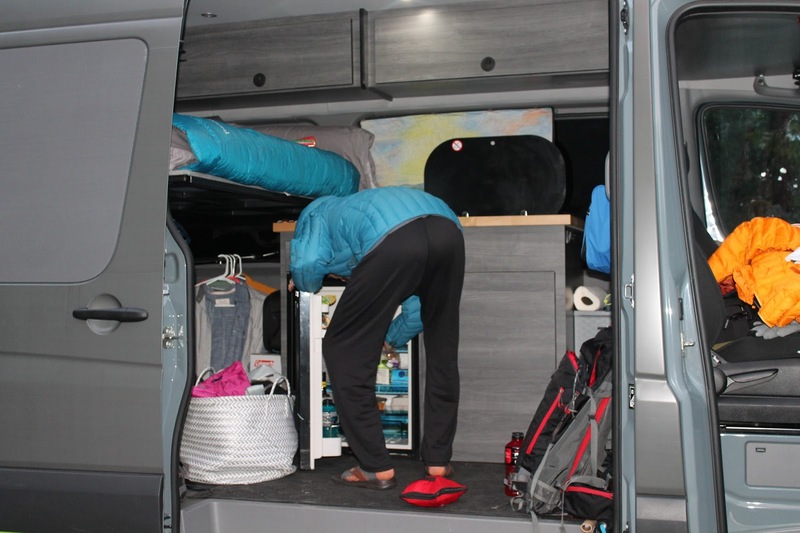 The van is more lifted off the ground because it is 4WD, so it's quite a big step to get into it, but the good news is even our tallest friends can totally stand up once inside with more than 6 feet in height. I was a little worried we would be cramped with all our stuff. 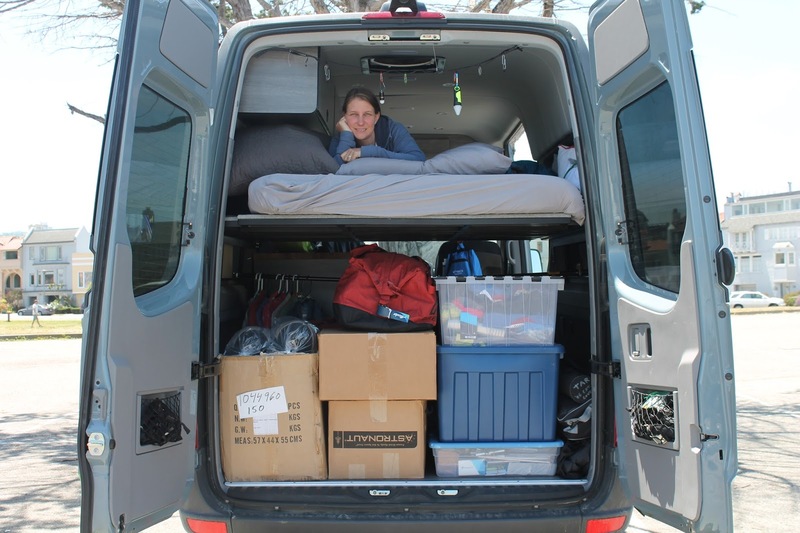 Besides the 6 duffel bags of personal possessions we packed to bring (climbing gear, clothing, grill, cookware, etc), our sponsors provided us with lots of giveaways for the 31 speaking events. 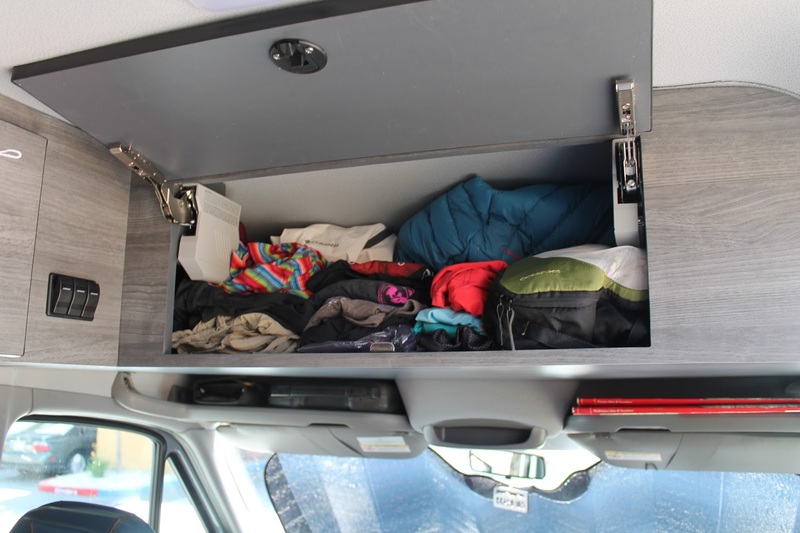 But, the van is built specifically for gear storage. All of our boxes and duffels fit perfectly under the bed area. We also purchased a shower curtain rod to put under the bed to hang our nice presentation clothes to maintain some semblance of normalcy. 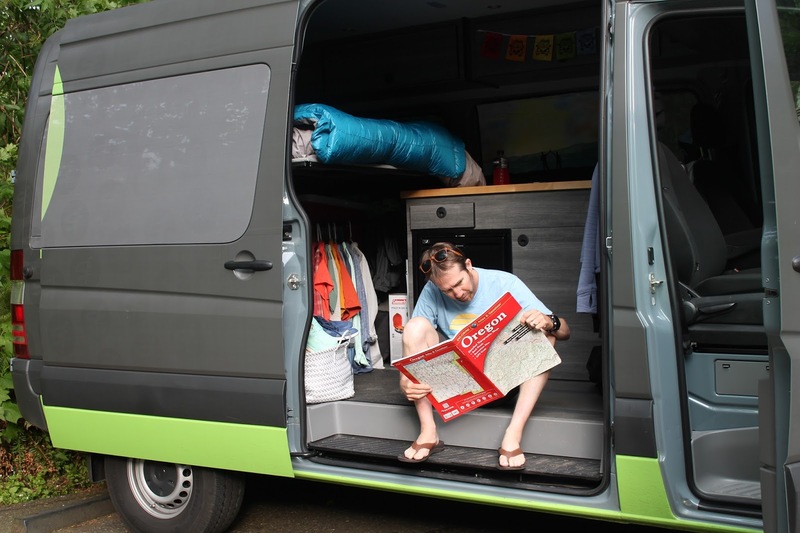 No matter how organized you are, there's always a lot of packing, unpacking and tetris puzzle movements in a van! 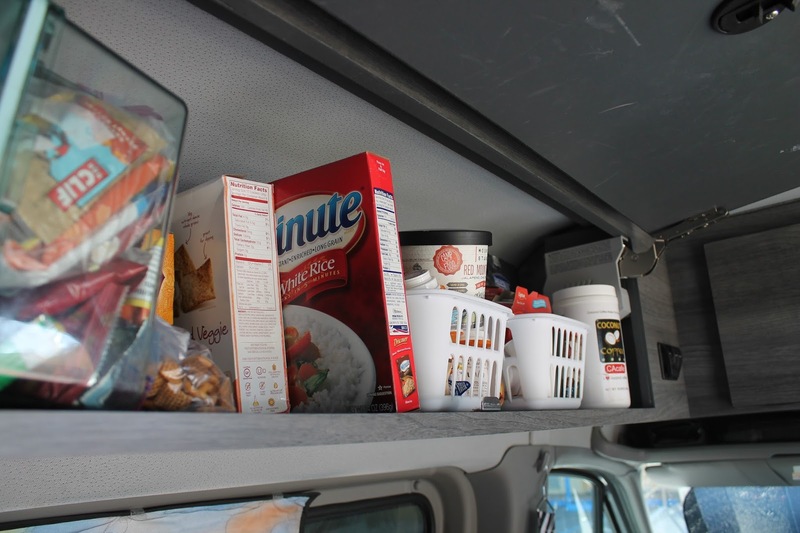 We use the 4 over-the-head cabinets for food, clothing and other supplies. There's also a plastic container with drawers where we keep all our cookware. 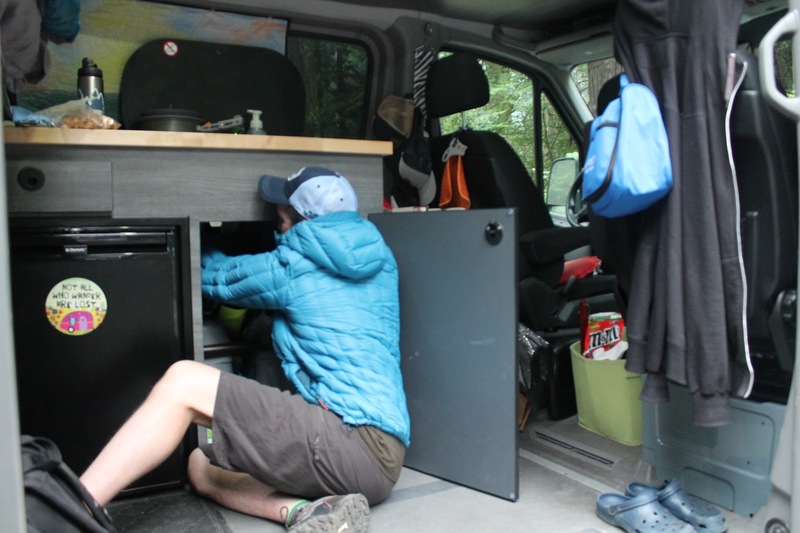 We have a small fridge, 2-burner propane stove and small sink. There are 2 five-gallon water containers under the sink, as well as another 5-gallon container for dirty water. It's been pretty simple to fill and empty the containers, but to be honest, I let Justin do all that! 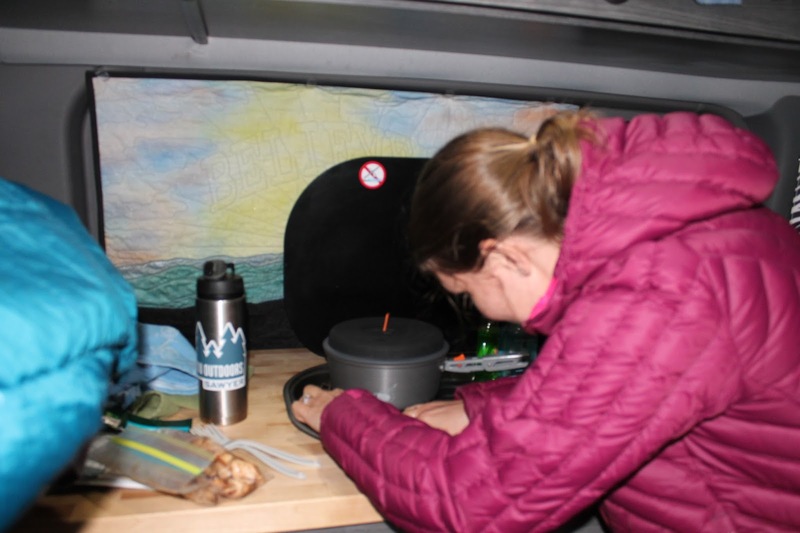 We love cooking in the van! 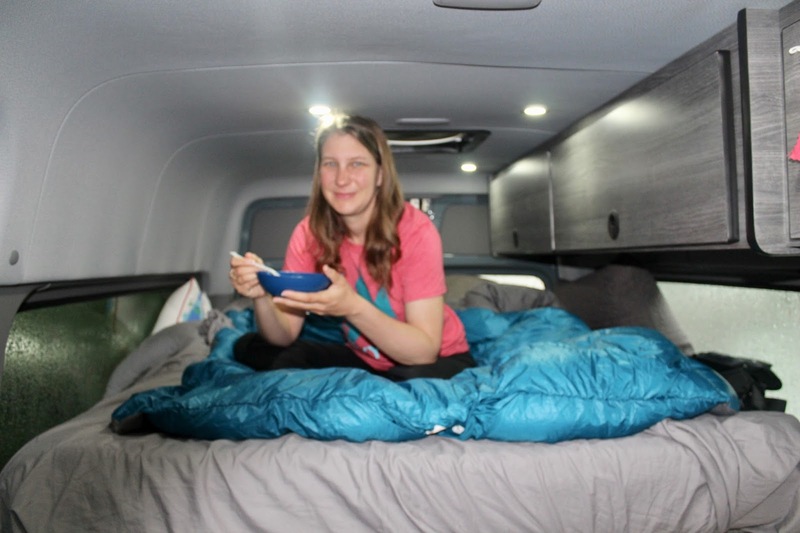 It is super easy and great for us to have that option to stay healthy on the road. Plus, we brought our portable grill, so that opens even more doors. 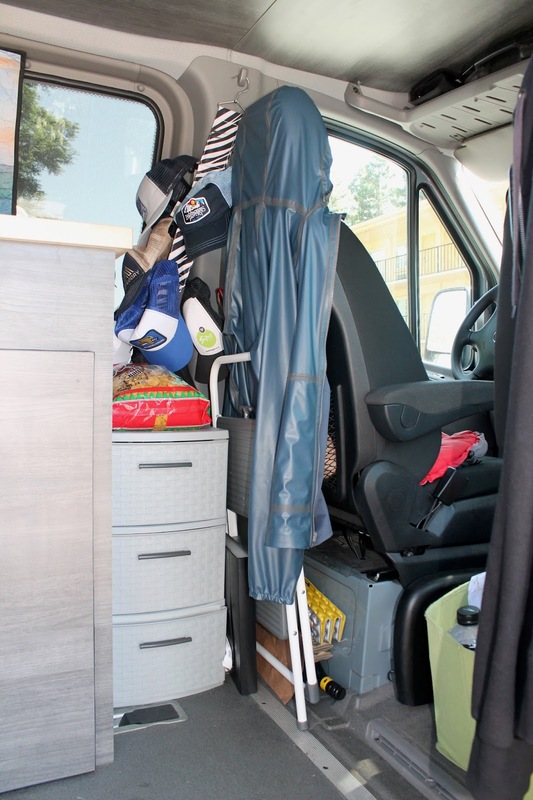 Oh, and yes, there is something most people deem as necessary missing: a toilet & shower. I say this with utter seriousness: we don't feel we need either. In our minds, it's a waste of space. Personal preference! The bed is 62 inches across, but the cabinets eliminate a little of that space, so we do have to cuddle a little more. We can sit up, but it is a little tight for that. 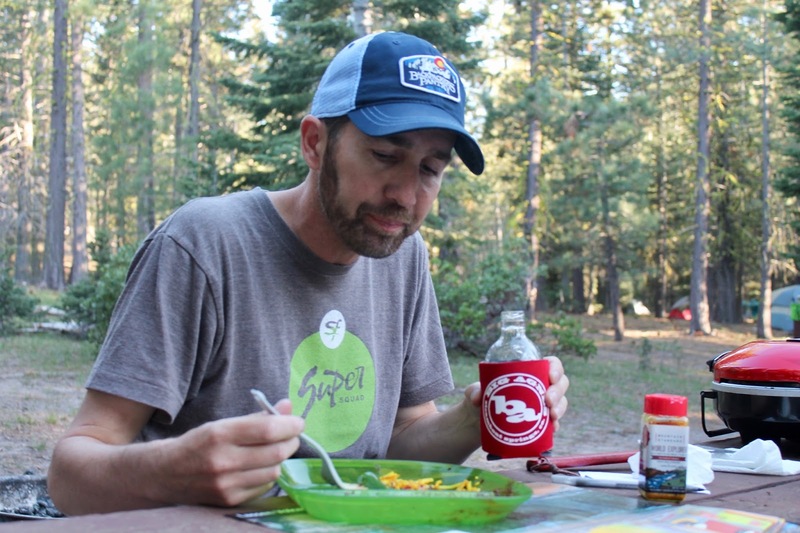 We typically eat at picnic tables, but sometimes we eat inside when it's too chilly. 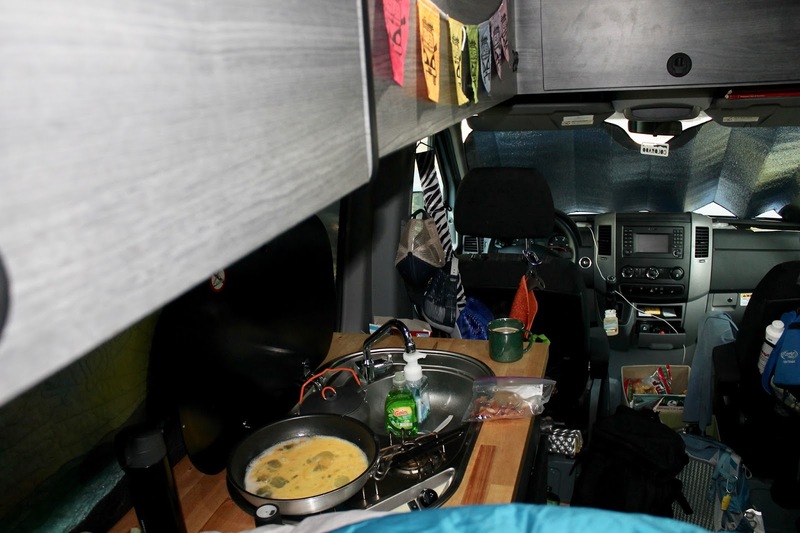 It's perfect because our camp chairs and camp table actually fit nicely in the "galley."